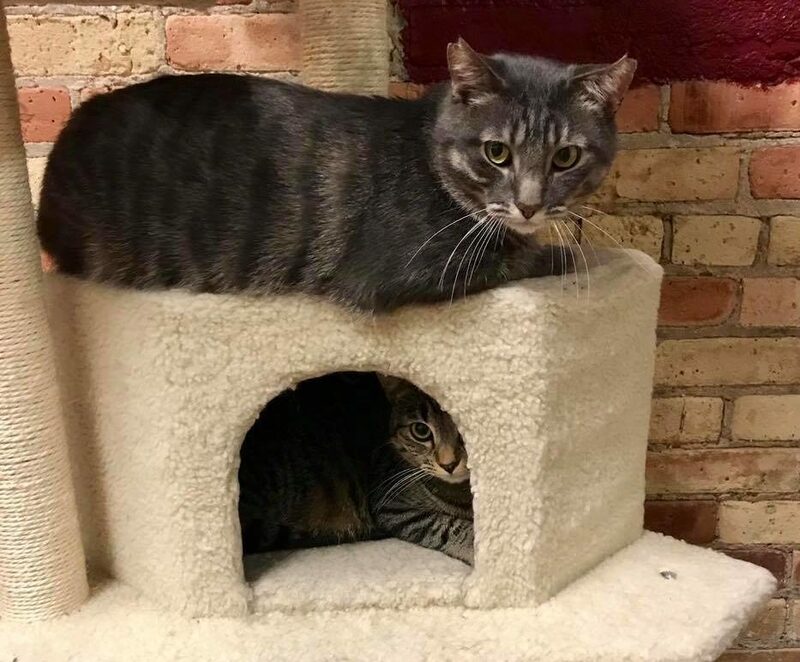 Blueberry and Alpine would like to go to a home where they can stay together. Here’s a biography from Big Al’s old foster family in his old city! “Alpine (a.k.a. “Big Al”) was trapped and brought to the shelter last April as a “feral”. Due to his fear of humans, he was classed as needing a home as a “working cat” and made available as such. In his shelter cage, he sat for many months waiting for someone wanting to take him and some of his other scared friends out to a barn to live out their lives but it was slow, and no one was looking for working cats at that time. By August 2017, Big Al and some of his friends were brought to my home to “foster” until they got jobs. Well, in the luxury of big living space, spacious towers, windows and lots of company, it became apparent that this big guy was a scared kitten trapped in a big scary looking body. He was gentle but cautious. Over time, he began to seek attention, made lots of bread (kneading) and eventually learned not to play so rough. We discovered that he was a nurturing surrogate for our orphaned kittens and we frequently placed orphans with him and he would groom them and tuck them in around his huge body. Some of them even nursed him!!! Yes, I said nursed him, they should suckle on his big fat tummy and that would comfort them. All the kittens are gone and it is apparent that Big Al is indeed an adoptable indoor kitty. If turned outdoors, he would likely get scared and run away. At this time, he roams free in our home and loves the company of other cats. He can still spook a little but quickly comes running for treats and will stand on his back feet and beg for anything that smells like a fish. We have also discovered that he can be quite chatty and hates to be alone in a dark room!! Blueberry was in the same foster home, and Big Al always kept her safe. Blueberry has anxiety, and would like to stay with her protector. While they are both shy, they are still very sweet. They need a patient home, as it will take them a few months to come out of their shells! Both are very food motivated! For a $100 adoption fee, Big Al and Blueberry can be part of your family!